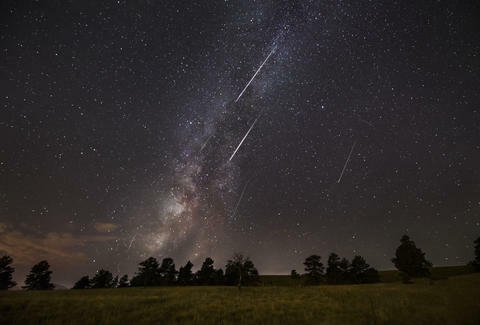 NASA Says the Best Meteor Shower of the Year Is Tonight. Here’s the Forecast. The Geminid meteor shower alights tonight (the night of December 13 into the morning of December 14), providing its best show around 2am local time. 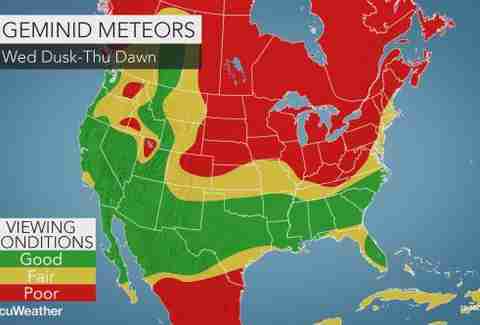 The Geminids should be 2017's best meteor shower in terms of meteor rate. Bill Cooke of NASA’s Meteoroid Environment Office tells Thrillist you can expect around 120 meteors per hour at the peak. "[The Geminids are] for the hardy," Cooke says. "If you go outside on December 13, you're probably going to freeze your tail off." That's true, and since it has already snowed in Texas and Georgia, you ought to get a look at the visibility in your area before you head out into the tundra. That's especially true because to get the best viewing experience, you need to head out into a field far from the lights of a city. That might mean you're looking at a late-night drive. Fortunately, Accuweather has created a map showing what the visibility should be like across the United States when the Geminids are hitting their stride like Martin Scorsese in the '70s. For the most part, the best viewing conditions will be found across the southern and western United States. The Rocky Mountains and parts of western Oregon and Washington are the exceptions there. The Midwest and Northeast will have some unfortunate timing. "An Alberta Clipper storm will spread clouds and some snow across the Midwest and northern Plains," Accuweather notes, "resulting in poor viewing conditions." However, the site notes that stargazers in the Northeast should get some reprieve with cloud cover having breaks where you can take in the show. This year's Geminids is well-timed. The moon won't be bright and obstruct your view like it did last year. Additionally, the shower is easier to see than some others. "They're famous for a lot of fireballs," Cooke says. "They're often described as bluish or greenish in color." That should help make the celestial show a little easier to see if you're competing with a little cloud cover or light pollution.